Well, you've recently purchased your brand-new home, do you know how to maintain it? Did you know that home maintenance classes can help save you money and be wiser about the maintenance of your home so that you can keep it in good working condition? Most first-time homebuyers are not too sure about the most basic skills needed to take care of a home. Sure, you can watch do-it-yourself shows and Google just about anything these days, but for some basic home maintenance tips, let me give you some items and some advice when it comes to maintaining your new home. Did you know that on average, homeowners spend about $6600 on home improvement projects per year. That's quite a bit extra then your mortgage payment and insurance. Do you have this set-aside? It's a good idea to start with a reserve of at least $1000. This is your "in case of emergency" fund. Should something need repairing or replacing that you had not expected, this is where you would use this money. On the heels of that, it's a good idea to plan out at least 3 to 6 months worth of income in case you should lose your job or have another emergency. Did you know that there are a lot of community centers that offer homebuying and financial literacy classes as well as how to improve your home. Each community is different so feel free to give me a call to find the home improvement class in your area. Simply knowing how to fix simple things in your home can empower you and save a ton of money. The last thing you want is to go into debt because you're always hiring someone to fix everything. Now, this doesn't mean that you need to be a certified electrician or plumber, but understanding how things work, having a basic toolkit and knowing how to work those tools is imperative as a homeowner. Some of these classes do cost money, but you can offset the cost with what you'll save on repairs and calling someone else every time a picture falls, a screw is loose, or you need to replace the door jam or window screen. These are simple little things that you should know how to do is a homeowner. It's also important to know when to hire someone else. Some items should not be handled by the novice homeowner such as major electrical repair or replacement. These things can be dangerous so it's important to get a certified electrician or plumber to take care of any ongoing or major issues. But, simply understanding how your house works and having the knowledge to replace window screens, blinds and curtains, doors and door jams, doorstops, closet doors, small caulking and silicone jobs, and simple repairs in the bathroom and kitchen like fixing leaks are essential to homeownership. 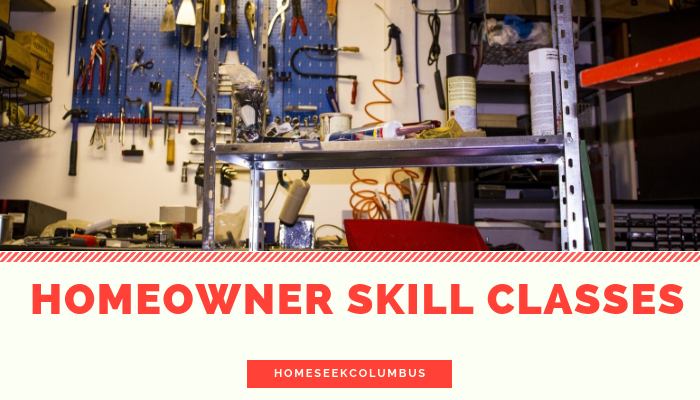 So, if you're looking for a basic homeowner skilled class in your area or anywhere around the Columbus area give me a call. I will put you in touch with those that have such a class and help you to be a more informed homeowner.